Officials at Glacier National Park in Montana have set up two webcams aimed at a black bear who seems unsure of whether or not it wants to keep hibernating. 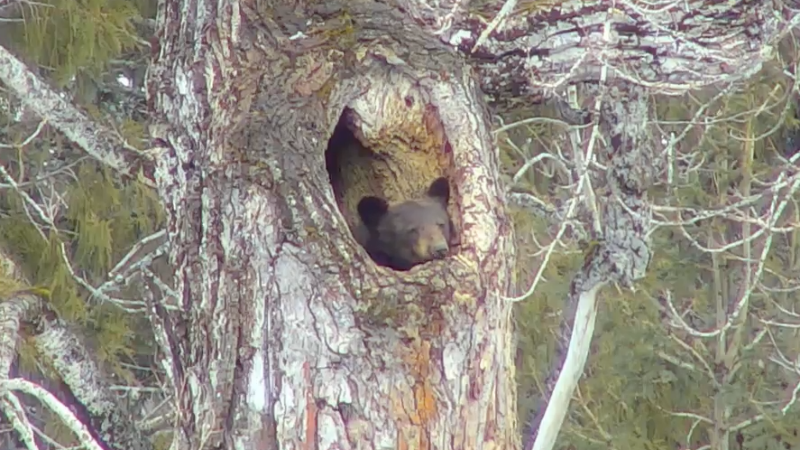 The bear is chillin’ in a cozy den located in the trunk of a cottonwood tree more than 50 feet above the forest floor. I have decided to stan this bear forever. The webcam mostly captures the bear—who park officials believe is a dude bear—sleeping, but there are moments when the bear is quite active before retreating back to its den. And here’s the bear makin’ friends with a bird. “He’s nice,” said Megan Reynolds. An unsubstantiated claim, but potentially true. Comin’ out of my den and I’ve been doin’ just fine. Apparently we all decided that the bear was a lady bear. The bear did, in fact, turn around after that. According to Glacier spokesperson Lauren Alley, one couple decided to name the bear Bruce. I personally feel indifferent about the name Bruce, but I am very curious to hear other bear name suggestions.